We already know that Spider-Man is the biggest money making superhero on the planet, but get this: merely the announcement of being linked to Marvel's Cinematic Universe has seen merchandise based on the webslinger skyrocket in popularity. In fact, sales for products themed around the web slinger picked up again following the announcement of Marvel's new relationship with Sony. The character generated another $1 billion in global retails sales last year, NPD Group said. "It's ignited the marketplace with what's to come with Spider-Man in the future," Gitter said of the new deal with Sony. "The retail community is rallying behind Spider-Man in a pretty significant way." When you hang out a lot in the world of comic book nerd culture like we do, sometimes it's easy to just sort of accept Marvel's seeming ability to do no wrong as it takes over the entertainment industry as if it's no big deal, but something like this throws the power the MCU wields into stark relief. 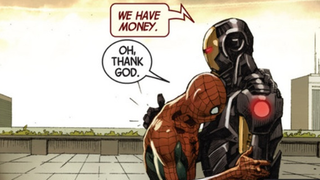 Just think about it for a second: Spider-Man already makes more money than any other comic book hero, more than big stars like Batman or the Avengers combined. Just the mere confirmation that he's going to be standing alongside Marvel's other cinematic superheroes has seen a surge in money even beyond that. What's it going to be like when he actually does show up? I imagine this is a pretty accurate reflection of what Marvel's head office will look like the day after the first Spidey-starring trailer for Captain America: Civil War drops.